These lands are your lands. And they can help you learn precious truths. Three days earlier, the 28-year-old had been working in a carriage wheel factory. As he was using a metal file to tighten stitches on a spinning machine belt, the belt caught the tool, tore it out of Muir’s hand and flung it into his right eye. His cornea was punctured and aqueous fluid began seeping out. “My right eye is gone, closed forever on all God’s beauty!” a co-worker heard him shout. Muir managed to walk home and put himself to bed. But within a few hours, his left eye also began failing. Soon he was entirely blind. This man’s response to his injury not only changed the course of his life, but also began a process that would change the course of the United States—in a way that has enriched life for millions of people. Muir believed he was permanently blind. It rattled him to his core. But an expert eventually examined him and said his left eye had only gone into a temporary sympathetic blindness and would fully recover. Muir was told that if he stayed confined to a darkened room for several weeks, that his right eye could also partially recover. To John Muir, this was a new lease on life. His employer offered him a promotion. Muir was a gifted inventor and a highly skilled mechanic, so his manager wanted to keep him on. But Muir refused the advancement and resigned. Due to his injury, he “saw the world—and his purpose—in a new light,” he said. Before his injury, the Scottish-born Muir had loved studying God’s creation, especially trees and plants. But after those dark days when he thought he would never see it again, Muir realized that seeing the creation, gaining insight into the Creator’s mind, was even more precious than he had thought. Within a few months, Muir’s left eye was fully restored, and his right eye had recovered considerably. On Sept. 1, 1867, he made good on his pledge to devote himself to “the inventions of God” and began walking—from Indiana to the Gulf of Mexico. “My plan was simply to push on in a general southward direction by the wildest, leafiest and least trodden way I could find, promising the greatest extent of virgin forest,” Muir wrote. He kept a journal during this trip, later published under the title A Thousand-Mile Walk to the Gulf. In his entry for September 10, he recounts his stay in the mountains of Tennessee with a blacksmith and his wife. During dinner, the blacksmith told Muir that he found it inappropriate for a man to spend his days studying plants. “[S]urely you are able to do something better than wander over the country and look at weeds and blossoms,” he said. Well, you know Solomon was a strong-minded man and is generally believed to have been the very wisest man the world ever saw, and yet he considered it was worthwhile to study plants; not only to go and pick them up as I am doing, but to study them; and you know we are told that he wrote a book about plants, not only of the great cedars of Lebanon, but of little bits of things growing in the cracks of the walls. Rather than taking offense at Muir’s biblical reasoning, the blacksmith admitted that he was right: The Bible tells believers in God to learn about Him by observing His creation. Two days later, Muir came to the first mountain stream he had ever seen. It left a deep impression on him. Traveling about 25 miles a day on foot, Muir traversed Kentucky, Tennessee, Georgia and Florida. He most often slept under the trees and stars. He often went hungry for several days. He survived several encounters with what he called “guerrilla bands who, long accustomed to plunder [during the Civil War that had ended just two years prior], deplored the coming of peace.” Yet throughout the hardships, his wonderment, his gratitude and his reverence at God’s creation continued and increased with every summit and every bend. He later walked from San Francisco to what is now Yosemite National Park. He solo climbed Mt. Whitney and Mt. Shasta. His numerous travels in Alaska led him to discover Glacier Bay and Muir Glacier. He took dozens of trips exploring the wild lands of the United States. But Muir was not content to just experience America’s wildernesses for himself. In the mid-1800s, American life was changing rapidly as the country industrialized. To many Americans, the country’s vast wildernesses were difficult, dangerous regions. Timber, ore and other resources could be harvested from them, but Americans would eventually conquer these alien places out of existence, replacing them with farmland, towns and cities. Factories and metropolises rapidly rose, forests rapidly fell, and wetlands were devastated. As the new century approached, the country had only a handful of partially protected wildernesses. No centralized method was in place for establishing, protecting and managing wilderness areas in perpetuity. The situation might have remained that way—were it not for John Muir. In the 1870s, he began writing newspaper and magazine articles promoting wilderness conservation. In 1892, he established the Sierra Club. By the mid-1890s, he had helped convince President Grover Cleveland to reserve 21 million acres as public wilderness. It was a great victory for Muir. But the administration of William McKinley, who succeeded Cleveland, withheld the plan from the public. Under pressure by timber and mining barons, Congress and McKinley introduced a bill lifting protective restraints from reserves and encouraging them to be commercially developed. Muir wrote two articles, one for the Atlantic Monthly and the other for Harper’s Weekly, alerting readers to the dangers of turning America into an industrial park. Public opposition to McKinley’s bill grew. And after being passed in the Senate, the bill, largely because of Muir’s articles, died in the House. When Theodore Roosevelt became president, he brought into the White House a keen interest in Muir’s message. Roosevelt wrote Muir a personal letter asking him to take him through Yosemite. On May 15, 1903, the two met near the Mariposa Grove. We are not building this country for a day. It is to last through the ages. After Roosevelt’s men laid down 40 thick woolen blankets for him to sleep on, he sent them back to town. He wanted to enjoy his time in the wilderness with just Muir. The two spent the next three days camping and riding mules to the stunning sites of Yosemite: Grizzly Giant, Sentinel Dome and Bridalveil Meadow. In their conversations, Muir made a convincing plea for some of America’s wilderness areas to be set aside and preserved for the American public to enjoy. This trip had a profound impact on Roosevelt’s outlook and his political trajectory. 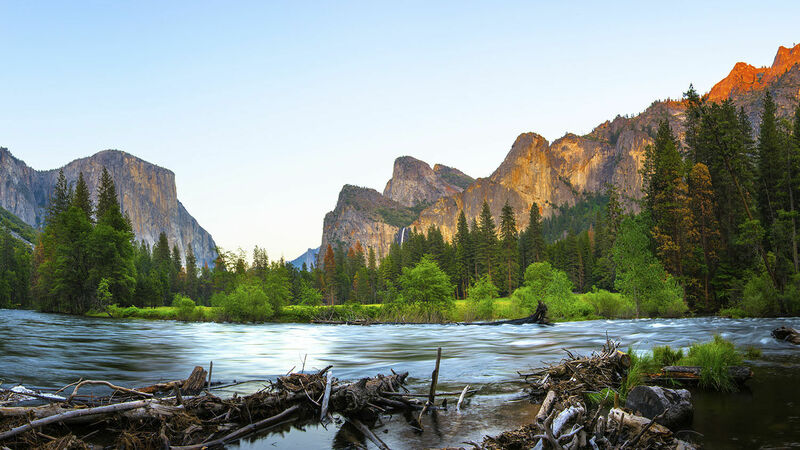 Soon after it, he established Yosemite as a national park to preserve its “majestic beauty all unmarred.” Americans should ensure that it be “preserved for their children and their children’s children forever,” he said. Altogether, Roosevelt set aside some 230 million acres of public land—including the Grand Canyon, Sequoia National Park, Kings Canyon and Mount Rainier—for all Americans and visitors to the U.S. to enjoy whenever they choose. Subsequent presidents have added to these designations, bringing the total protected area to almost 320 million acres (or 500,000 square miles), 14 percent of America’s total land area. This is thanks in large part to the influence and lifework of John Muir. The influence of America’s conservation movement also spilled across its borders, inspiring scores of countries around the world to protect, or better protect, parts of their territory. Today, there are some 6,000 national parks in more than 100 nations. In his magnum opus Mystery of the Ages, Herbert W. Armstrong lamented the way mankind often fails to build a balanced relationship with God’s physical creation. [W]hat has man done on the Earth where God placed him? Man has made ugly, polluted, defiled, profaned everything his hands have touched. He has polluted the air, befouled the water in the rivers, lakes and seas. He has deteriorated the land, denuded the forests, thus altering rainfall and causing the expansion of deserts. Mankind’s normal behaviors defile, profane and pollute the creation—with little regard for future generations. But thanks in large part to the work of John Muir, swaths of it have been safeguarded from those behaviors. This safeguarding is valuable mainly because the physical creation is the product of a perfect spirit mind, and the Bible shows that one major way we can better understand that perfect mind is by studying His physical creation: “For the invisible things of him from the creation of the world are clearly seen, being understood by the things that are made, even his eternal power and Godhead …” (Romans 1:20). The physical creation proclaims God’s eternal power! It lets us see His brilliance, excellence, love and glory. When we enter into it in the right attitude, we gain insight into the mind of the Creator. We learn that—from the microscopic to macrocosmic—He weaves excellence and splendor through every layer of His handiwork. We learn that He is the author of indescribable beauty. He is supremely intelligent, organized and perfectionistic. We learn that His power has no bounds. We can also learn, by comparing our own abilities to those of God, a valuable sense of proportion. This latter lesson is addressed in Job 38, in which God gives an admonition to Job that is pertinent to all people: As you experience this physical world, you should perceive God’s power that brought it into being; understanding the vastness of that power, you should become more humble and more reverential toward the Creator. Muir often mentioned the reverence and gratitude that King Solomon had for God’s creation, who likely learned it from his father, King David. “Let us come before his presence with thanksgiving, and make a joyful noise unto him with psalms,” David wrote in Psalm 95. “For the Lord is a great God, and a great King above all gods. In his hand are the deep places of the earth: the strength of the hills is his also. The sea is his, and he made it: and his hands formed the dry land” (verses 2-5). A single blade of grass whispers the same story that Utah’s Arches shout. David was deeply humbled to experience the physical world made by God’s hand. And when we experience the creation—as we do with intensity when visiting national parks—we can likewise be humbled and filled with gratitude and reverence. Muir said, “God has to nearly kill us sometimes, to teach us lessons.” But if a Psalm 95 kind of humility permeates us, we can often learn important lessons by more gentle methods. Of course, we don’t have to be perched atop a glacier in a pristine national park to appreciate God’s mind and power. A single blade of grass whispers the same story that Utah’s Arches shout. But if nature’s most awe-inspiring sites were indiscriminately plundered to maximize short-term profits, it would obscure an invaluable window that the Creator has given us into His spectacular mind. To understand the perfect Being who created the manifold splendors of the natural world, the entire vast universe, and who created you with the potential to be born into His Family, please order a free copy of Mystery of the Ages.